Step outside your comfort zone, and take advantage of SharePoint's blog, wiki and My Site features to unlock your users' potential. 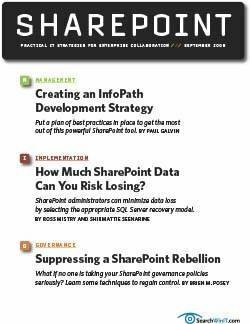 the power to unleash otherwise hidden employee potential than SharePoint's blog, wiki and My Site features. Like many new technology-driven concepts, social computing can be a little confusing as a term. Definitions run the gamut, but many people will agree that social computing is both a process and supporting tool set that enable individuals within an enterprise to contribute their knowledge and insight about the business. Social computing makes business knowledge easily searchable and accessible to everyone in the enterprise at any time through a number of search avenues. It really boils down to this: Employees know a lot of stuff. Social computing systems make it easy for everyone else to share and ultimately benefit from that knowledge. Companies that successfully integrate social computing into their bread-and-butter information systems stand to gain advantages that few people understood even a few years ago. We're surrounded by the obvious success of publicly available social computing efforts ranging from the simple blog up to fully featured social networking systems like MySpace, Facebook and LinkedIn, to name a few. It might not be entirely accurate to draw parallels from Facebook to your enterprise, but one thing is certain: If you build it, they will come. People love to share their knowledge and will do so willingly if given the opportunity. When employees have that chance to share knowledge through a wiki or a blog, they become invested in the enterprise in a way that an order-entry system simply can't bring about. A content-rating system improved perceived reliability and accuracy of a knowledge base at a pharmaceutical company. A blogger's series of "how-to" articles relating to approval processes at a manufacturing company brought company-wide recognition to that blogger and cemented his role as a business leader within his group. Perhaps more important, the article series helped uncover several inefficiencies in business processes that the organization was able to solve, resulting in both faster and more efficient business processing for years to come. 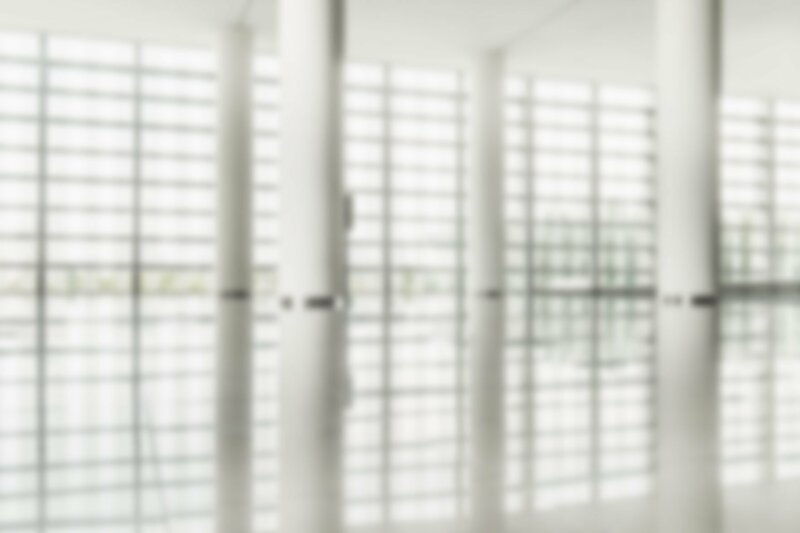 A large multinational company's strong and consistent initiative to create a personnel directory that included skills and interests helped everyone at any time locate experts as needed. Anecdotally, this led to a reduced need to hire subcontractors because the talent was often available in-house, but it wasn't easy to locate. Social computing tends to make traditional IT managers at traditional organizations very uncomfortable because it makes them feel like they are losing control. IT people invest a lot of time and energy defining business processes, building computing systems to support those processes and then rolling them out across the enterprise. At the end, they continue to maintain control. But social computing often injects disorder into the system. Suddenly, people are commenting on processes via blogs or even rating content using their own value judgments. It certainly turns the whole idea of control on its head. These traditional IT managers might reasonably ask, "Why social computing at all?" The answer is that there is a natural urge to participate in "What's going on?" that traditional back-office systems simply don't allow. When have you ever heard of a CRM system that includes a blogging engine as a core component or an ERP system that allows users to share their expertise and knowledge about product management via a community encyclopedia just like a wiki? Those systems don't provide an outlet for that kind of creative energy. As a result, creative energy is left bottled up inside people's heads. 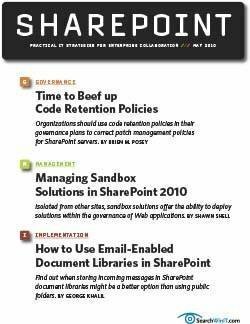 SharePoint allows your organization to uncork that energy in a controlled manner. How does it do that? 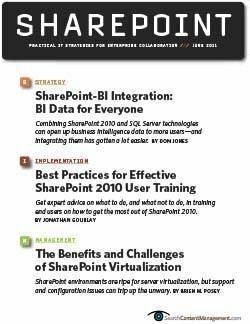 SharePoint is an excellent platform for initiating a social aspect to your company's computing systems. Out-of-the-box features like wikis, blogs, My Sites and others speak directly to classic social computing features. 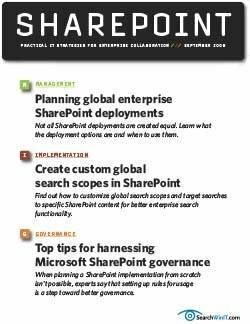 The SharePoint community, a vibrant collection of individuals literally across the globe, has extended the SharePoint platform and improved out-of-the-box features like blogs and added new features, such as tag clouds, that are not present in the core platform at all. To top it off, a variety of third-party companies have created products whose entire focus is social computing, making it pervasive throughout the product. Bloggers have full editorial control over their content. They can control who views their blog, what they want to write and when and how their writing shows up in search. 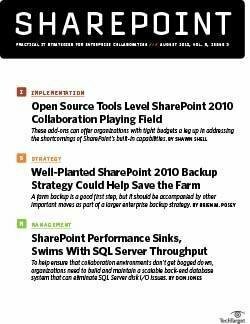 Lastly, SharePoint 2010 is poised to extend SharePoint's social computing infrastructure in new and interesting ways that is sure to cement its role as a top-tier social computing solution for the next several years. 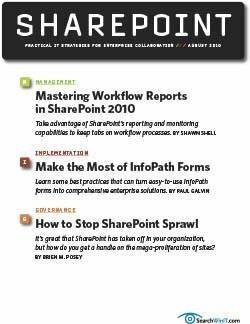 Blogs allow users to become authors, and SharePoint provides an outlet for authors that is appropriate and useful in a corporate enterprise. A built-in blog feature of Microsoft Windows SharePoint Services and Microsoft Office SharePoint Server (MOSS) 2007 allows users to write on any subject they want. Bloggers have full editorial control over their content. They can control who views their blog, what they want to write and when and how their writing shows up in search. Blogging won't appeal to everyone, but you'll be surprised at how many people will be happy to share their professional experiences with their peers and enjoy the recognition that comes with it. Without blogging to provide an outlet, this information would remain largely hidden and passed around in a much less efficient manner. Of course, that "full editorial control" can be scary. In fact, blogging is a big responsibility for both bloggers and their employers. 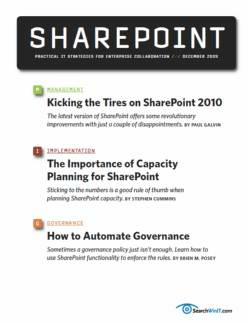 To an extent, a SharePoint governance plan can and should address some of the concerns that arise. For example, where should blogs be located in the site taxonomy? And who has control over what tags can be used? One word of caution: Blogging can veer into the irrelevant -- describing a kid's birthday party or discussing politics -- to the outright inappropriate or even illegal, such as sharing trade secrets. In the end, common sense must prevail, and including parameters of social computing in the governance plan is a good start. Out of the box, blogs have some weaknesses. Blogs allow you to assign a category, such as "workflow," to a particular blog entry describing how to implement a particular kind of workflow solution. Unfortunately, SharePoint allows only one tag per blog entry. This limits the author's ability to properly describe the entry. It is not as easy to personalize the layout of a SharePoint blog as users would like. 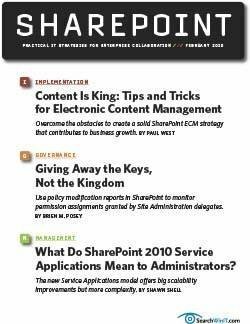 Despite these drawbacks, the core blogging engine in SharePoint is solid and sufficient for most organizations. 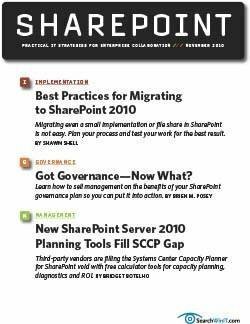 However, the SharePoint community has stepped up to the plate and provides free extensions to the platform that address these two shortcomings and enhance it even further for advanced needs. Much like blogs, wikis turn everyone in an organization into a potential author. In contrast to the individuality of blogs, wikis are distinctly community-driven and managed. SharePoint provides a solid wiki tool. Anyone with permission can create a new entry in a wiki or directly edit an existing wiki page. 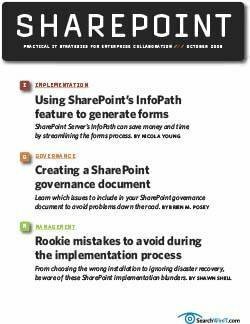 SharePoint tracks changes to wikis over time so that they can be managed by one or more content czars or in accordance with your SharePoint governance plan. Companies use wikis for a variety of purposes. IT departments may use wikis to make a note of important system changes over time that becomes a running and long-living record of important system events. Business analysts set up a wiki to work with a team of end users to define business requirements. The analysts conduct interviews and document requirements in a wiki. End users view and directly update those requirements. This provides a tight but open feedback loop that reduces the risk of error and generally improves quality across the board. Upon completion, the wiki can be turned over to the development team for reference and comments, extending the feedback loop from end user directly to programmer and vice versa. Wikis have their weaknesses too. Whereas a blog has one author, wikis have a multitude of authors who may not always agree on the SharePoint templates used. As a result, it could be difficult to create a consistent look and feel for a knowledge base-type wiki without investing a lot of effort on an on-going basis. 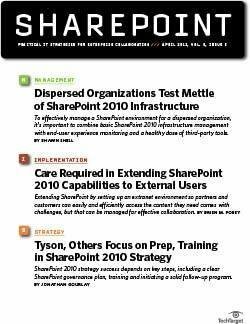 SharePoint holds a lot of information about individuals in an organization. It knows my manager and my manager's manager. Blogs and wikis allow the community to express itself, and that's powerful stuff. However, MOSS Enterprise goes further and provides a great deal of social information at everyone's fingertips via people search and My Site functionality. 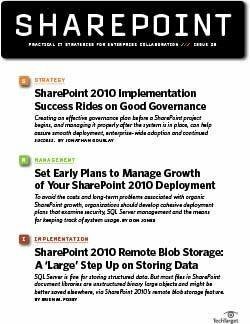 SharePoint holds a lot of information about individuals in an organization. It understands reporting structures via Active Directory. It knows my manager and my manager's manager. Using that same information, it can figure out who my colleagues are. And when that's not good enough, SharePoint allows users to adjust and expand inferred relationships with their own concrete data. For instance, I have a colleague I work with on a regular basis who is not part of my org chart. Even though we have a work relationship, it may not be captured in Active Directory. I can explicitly define that relationship in SharePoint by defining my own colleagues. SharePoint uses these social connections to provide an enhanced search experience by taking social relationships into account when determining relevancy. If I execute a search and the search returns 10 items, SharePoint will rank my colleague's results higher than other results, although search relevancy is complicated and may not be as simplistic as I imply. SharePoint gives people control over their own social profile within the organization through My Site functionality. 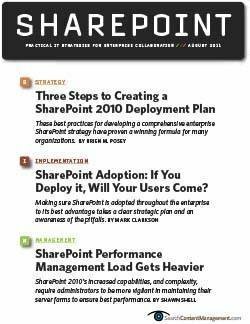 My Site is a SharePoint site -- actually a site collection -- set aside for each user in the organization. My Site allows users to define their social profile by specifying their picture as well as their responsibilities, skills and more. 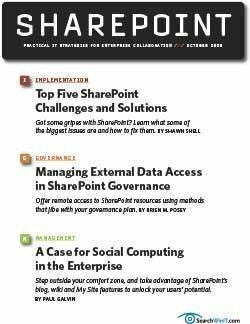 From a governance perspective, SharePoint allows managers to define which profile properties cannot be modified by end users, such as their direct managers, and those that can be controlled by end users, such as their personal interests. The SharePoint platform enables other classic social computing features, such as tagging content, rating content and more. 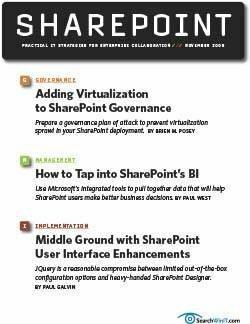 SharePoint 2010 promises to take these features to entirely new levels and make social computing as pervasive -- yet controlled -- as your organization may need. If you haven't done it already, seriously consider defining a plan to roll out social computing tools for your enterprise. No one likes to leave money on the table in a sales situation. Likewise, no one wants to leave employee talent bottled up for lack of a proper bottle opener. SharePoint is your opener. Paul Galvin is a SharePoint MVP and co-founder of Arcovis, a SharePoint consulting organization providing services to clients in the New York metro area. 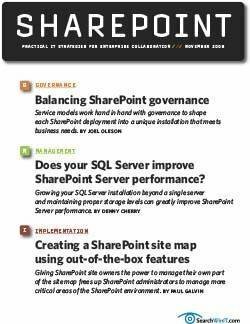 Galvin has worked in the IT industry for more than 15 years in areas such as software development, consulting and SharePoint solutions design, where he works with clients to create business solutions using the SharePoint platform. He contributes to the SharePoint community through MSDN forums and his blog at http://paulgalvin.spaces.live.com.